This sweet potato hash makes a perfect healthy breakfast. Sweet potatoes and zucchini are spiced with smoked chipotle and lightly pan fried until crisp tender. Finished with a poached egg and fresh cilantro pesto. This easy breakfast hash is Whole30 Approved, Paleo, Gluten-Free and Dairy-Free. Pulse the almonds in a food processor until slightly broken down. Add in the parsley, cilantro, salt, pepper, avocado, and lime juice. Process until smooth. In the opening of the food processor, slowly add the olive oil with the food processor running. Process until smooth. Heat a large skillet, or cast iron pan, to medium-high and add in the oil. In the meantime, bring a stockpot of water to a simmer for the poached eggs. Add the sweet potatoes,salt, pepper, chili powder, and onions to the skillet. Cook for about 15 minutes, until potatoes are browning and becoming fork tender. Add the garlic, bell peppers and zucchini and saute for another 5 minutes-7 minutes. Add in greens and cook until just wilted. While hash is cooking, bring a large saucepan of water to a rapid boil. Add 2 tablespoons vinegar to simmering water and swirl water together with a spoon. Add the eggs, one at a time, to the swirling water and gently swirl the water once all the eggs are back in the water. Let cook for 3-5 minutes, depending on how runny you want your yolks. Remove eggs from water with slotted spoon onto a paper towel lined plate. Place A quarter of the hash onto each plate. 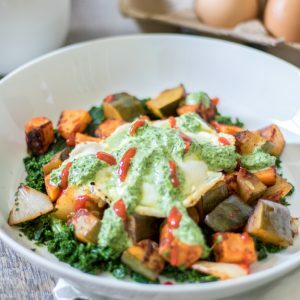 Top the hash with an egg and drizzle over 1 tablespoon of pesto. Hot sauce is optional. To get this breakfast on the table quicker, use leftover Baked Sweet Potatoes. Dice up the leftover cold potatoes and this hash will be ready in faster. An egg on top is a great way to bump up the protein and moisture to this dish. However if a fried or poach egg is not your thing, scramble in some eggs into the hash at the last 5 minutes. If you don't happen to have fresh spinach or kale, use frozen and add to the hash when you add in zucchini and peppers to skillet. This cilantro pesto is great served on chicken or burrito bowls as well.